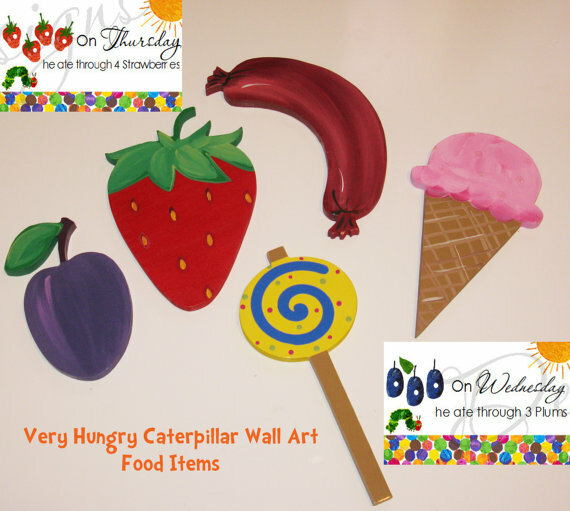 Custom painted very hungry caterpillar food items made to match Pottery Barn Kids or any Very Hungry Caterpillar nursery/big kids bedding or theme. These also look great in the bathroom, playrooms, and as party décor! Love Very Hungry Caterpillar? Be sure to check out my store I have lots of different custom painted items made to match! Please allow 4-6 weeks for the creation of your items. Rush orders are available for $35 and are a 1-2 week lead time. Please keep in mind that these items are completely handmade I do every last detail on my own including cutting and prepping them for paint. A lot of time and care is put into my items. No items are premade. Patience is required!